This is the plantar fasciitis forum, a place where stories about plantar fasciitis treatment will be shared. Comments and questions can be asked generally or specifically to the story-tellers and responses will be provided as quickly as possible. As you know, the journey may be different for each person. Thus, some of the stories will include information about treatments and products that worked to achieve heel pain relief. Others will indicate that the individual is still working to discover the “cure,” if one exists. As I searched the internet for the best treatment for heel pain, I found several blogs that mentioned plantar fasciitis as it related to their own situation. Often, the individual who wrote the blog shared at least a little about their personal struggles with the pain. I also noticed that several sites had discussion forums about heel pain issues but not very many focused on having other individuals share their personal journeys with plantar fasciitis. How have others coped with plantar fasciitis pain? How long have they dealt with it? What caused the pain in the first place? What type of plantar fasciitis treatment did they use? What products have they used that have been helpful in relieving and/or eliminating heel pain? Personal stories can be very helpful. Just click the links in the drop-down menu below the Plantar Fasciitis Stories link to read how others have coped with plantar fasciitis or other heel pain difficulties. Hopefully their stories will help you see that you can overcome your own issues with heel pain. Failed plantar fasciitis surgery and a stress fracture here. Yep, flip flops are permanently off my list except for using them for the shower at the gym! Now I have to wear orthotics all the time and cute shoes are nearly impossible to find. And I may never walk barefoot again, too painful. The quickest way to destroy your feet is to wear heels all day and then put on flip flops when you get home! Trust me ladies, it is so not worth it. You and a lot of people, Chloe. Sorry to hear about the failed surgery. Take a look at Anyone Can Do This! Foot Massage with a Ball. These exercises might be helpful. One of the two videos listed at the end of the article mentions the difficulties with high heels. Get IMMEDIATE PAIN RELIEF with World’s Most Comfortable shoes, or your MONEY BACK. Anatomical Gel Orthotic, Air Cushioning Sole, Seam-Free & Roomy Interior. Thanks for pointing these out to Chloe. Obviously, there are several potential solutions, hopefully one of which will work for her. Between Stephen’s suggestion of custom orthotics and your suggestion of proper shoes, perhaps one be best for Chloe. My heels start aching really bad when I walk across the floor. It is when I wake in the morning and take my first few steps. I am now undergoing orthotics treatment from Physiomed in Toronto. I have bought new heel pads for shoes. Hope this helps. Sounds like you are doing all you can to overcome your foot problems, Shannon. Thanks for sharing with us. I wear heel pads all the time now, along with soft-soled shoes, and it has helped a lot. I also have had pain in my feets. I feel it when I wake in the morning and take my first few steps. I tried Compression Foot Sleeves by Treat My Feet and for 2 months and got good results. I hope it will help others too. Thanks for adding to this discussion, Emma. I haven’t actually heard from many people who have used compression socks so it’s good to hear that they are working well for you. Orthotics, compression socks, good shoes – they all can contribute to the healing of our feet. Plantar pain is common in the morning if you suffer from PF. Try the socks overnight, do some plantar and calf stretches when you wake up, and wear suitable shoes – good arch support, good heel support, and good cushioning (ShoeWOW Plantar Fasciitis Shoes. Doctors are only likely to treat the symptoms, unless it gets unbearably bad, in which case you might get plantar fascia release surgery. Even this doesn’t guarantee the problem won’t return though. Hi Matt – What you’ve said reflects basically what I’ve been saying throughout my articles. Several of my early articles described issues related to shoes including my own personal story. I had a case of very bad shoes that I subsequently changed out for good shoes. I haven’t really written a “good shoe review,” however. Thanks for your words of wisdom. The insoles on the page you point to appear to be very similar to the types of insoles I can buy at my local CVS drug store (which is where I buy mine). From the looks of the assorted types available, at least one of them will probably be helpful for the majority of individuals who struggle with plantar fasciitis. Do they cause one to alter the way they walk? Most of those will not. I’ve worn heel pads and orthotic insoles since my bout with pf and found them to be comfortable. Some cases may require more customized inserts such as those used in Neil’s story. I had orthopedic plantar fasciitis release surgery a week ago, after suffering since November. Since the pain started, I have had two cortisone shots and 13 PT appointments that just made the pain worse. Has anyone else had this surgery recently? My doctor said I might try wearing tennis shoes after a week however with the stitches still needing covered via ace wrap and surgical gauze, my foot won’t fit in them so I’m still wearing the surgical boot. Just wondering what others experienced and how long their recovery took to feel normal again. Beckie, that is quite an ordeal. So sorry to hear about shots and physical therapy appointments, all for naught. I sure hope the surgery does the trick. The very first comment on this page, from Chloe, mentioned a failed surgery but I haven’t seen any other surgery comments on this page (could be others scattered around the site). Perhaps someone else out there will read your comment and respond with their own experience. What I’ve done to help with my intense heal pain ,😈 first you need a stretchy arch band , (can purchase on Amazon) a Toaob 2.48″ Stress Squeeze Relief Ball, Or any light weight, soft squeeze – 3 inch ball (no gel balls, they have to be easy to squeeze and have sponge inside). Roll of white sport tape. Gel shoe inserts . Now, tape your heal with sport tape, (look up how to, on youtube) place arch band onto foot, cut your ball in half with a paring knife ,slip half the ball on the under side of your foot ( rounded end against foot) inside the arch band. I hope this helps others, God bless. Hi Dee. This is fantastic. Thanks so much for sharing this method! I Haven’t seen anything like it before but, then again, I certainly haven’t heard all the various ways that can help relieve the pain. I’m so glad it’s worked for you and hopefully it might help others who suffer with heel pain specifically. I’ll do some research to see if I can find anyone else who has recommended this type of method. As Chloe implied above, surgery should only be a very last resort. There are so many great ways to help plantar fasciitis. There’s stretching exercises, and massage with a foot roller/ball, orthotics, etc. All these will benefit but if you try orthotics, make sure they’re custom fit to your foot and also make sure they support ALL 3 arches of your feet in order to properly correct your foot pronation and help heal your plantar fasciitis. I wear custom orthotics from Foot Levelers. They’ve been around for a long-time (60+ years) and have supported all 3 arches during their entire life. They have great information on Plantar Fasciitis as well as a video on how to treat here. Their orthotics have helped me tremendously. I had so much pain every time I stood up, walked, or squatted (because of my knee pain). After about 2-3 months of learning them, pain is almost completely gone! Thanks, Stephen. That’s good information; similar to the solution Neil describes in his story – custom orthotics. What you say about exercising is very true. In fact, the reader can discover a bit more detail by clicking these links: stretching or massage with a ball or water bottle. In addition, on this site I’ve expanded on several of the points made on the webpage you pointed to: what is plantar fasciitis. I appreciate your expansion of Chloe’s information. What runners are best for orthodics? Joanne, you ask a very good and tough question. Tough because not everyone is the same so there is no single answer to this question. Neil’s story in this forum talks about how he used custom orthotics to help overcome his problems with plantar fasciitis. But for many, simple orthotics purchased at a drug store could be effective. I haven’t specifically addressed this topic to this point, so let me say that one general article that I could recommend is called A Guide to Running Shoe Inserts (written by Richard Lovett) on the Runner’s World website. You can read a number of other articles on this topic by Googling “best orthotics for runners”. I have suffered with plantar fasciitis for close to three years now. It is an incredibly painful and frustrating disorder. I have tried almost everything – custom orthotic inserts, physical therapy, cortison injections, a walking boot, heel lifts, surgery, etc. I have started a blog documenting my journey with PF that you are welcome to check out my blog for some tips and advice. Thanks, Becky. Sounds like you’ve had quite a trip with pf! I hope a few people find the link and take a look at what you have to say. The more help people can get to overcome this, the better. I’ve had heel pain since I started working for walmart. Now that I’m at a brand new store, the pain is so bad that I spend my day limping. I went to the dr a few days ago and have been diagnosed with plantar fasciitis. She put me on prednisone (which isn’t doing anything to relieve the inflammation) and to rest along with stretches and ice. I can’t afford to rest at my job as a department manager. I’m not sure what to do during the day. If I sit or rest for too long because of the pain I get into trouble or have an even harder time getting back up. The pain makes me want to cry sometimes. Help? Alexandra, so sorry to hear about your situation. My first question regarding what you might try to do would be: have you looked through some of the potential methods of dealing with plantar fasciitis that have been discussed on this website? Stretching and rest are good but obviously you can’t rest on the job. First of all, think about the type of shoes you are wearing. You should wear comfortable, flat shoes. You could try simple orthotics available at CVS or Walgreens. Also, there are a number of things you can do to try to alleviate some of the pain, including rolling your foot on a ball or stick while sitting at a desk or at home in the evening, applying self-massage, or working on trigger-point therapy. Hopefully, if you read through ideas on this site or on others, you’ll try some of them and see if one or more can help your particular situation. Remember, there is no ONE solution to plantar fasciitis. Everyone’s situation is different. Hope you can find relief quickly. Hi Alexandra, I find compression socks really help me while working on my feet all day. They won’t cure your PF but will give relief. Well they do for me.. Good luck! I was diagnosed over a year ago. I have had countless physio sessions and various different specialists massage, I’ve had electro therapy, special inserts, mri scan, the scaring is forming with the bone now. My specialist is running out of ideas. Surgery next? Came from body building without stretching. I stretch all day long now and use balls and other things to roll under feet. Nothing helps for long. It’s like everyone wants to make money from you without it having any benefit. Depressing. Hey Bill. I’m so sorry to hear your situation. You’ve pretty much tried everything, haven’t you? Yours is one of the worst situations anyone has written in about, especially when you talk about the scarring forming with the bone. I did find an interesting article in Podiatry Today (author Bob Baravarian, May 2010). It’s a bit dated but talks about a number of further options when the problem has gone well beyond more normal inflammation issues. I’m curious to know if you’ve looked into any of the mentioned procedures. I’ve experienced such intense foot pain that in the past I had to curtail my gardening activities. These shoes have given me back my gardening life. I can now stand again for hours without discomfort. Orthofeet are definitely not the most attractive shoes I’ve ever had, but they are qualitatively the most comfortable walking shoe I’ve ever put my feet into. The shoes were true to size, and were “out of the box” comfortable the first time I put them on. Hi read a lot comment you don’t find definitive resolve for heel spur. Many people suffer in heel pain and there is a one resolved without surgery. I had too it. I found effective cream in Europe. The treatment fast and painless. And the best It have a guarantee if it don’t working within 2- weeks they pay back money. Thanks for the information, Anita. I haven’t heard of this cream previously. Perhaps there are others who have heard of this and can give their opinions. The only way that helped me get rid of the pain plantar fasciitis is a whole package of measures. There are exercises, diet, special shoes. All this methods must be observed. In this article write about it. I liked advices in the ast plantar fasciitis cure book. I have been fulfilling these rules every day for 1.5 months. Now there is no pain at all. I started to play sports and don’t pay attention to the heel. I have a more sparing regime on my new job. Thanks for the good tip on this article, Jathan. It looks like it has some very good advice. There are many websites that include helpful tips for fighting plantar fasciitis, so I appreciate the referral to this one. G’day. I’ve been suffering heel pain for roughly two months where it was worse in the mornings and subsided during the day. Some days the pain very mild; others extremely intense. Actually agony is the only way to describe it. In the end I hobbled to a doctor who pushed on my heel. I nearly screamed in agony. He ordered x-rays and told me the bone looked ok and that I had plantar fasciitis and to see an ortho. I saw the ortho and he pushed in a number of areas all over my foot. Including my arch. No pain – except on the heel. He diagnosed me with calcification of the heel. I had a pair of orthotics made with a ‘donut’ hole where my heel pain was. I’ve been using RICE, plus ball exercises plus anti inflammatory tablets. The pain has subsided somewhat but is still there (been wearing orthotics for 6 days). I’m questioning the pain on the bottom and outside of heel and wondering if an ultra sound would show if there is tendon damage? I guess the main question is should I get a second opinion? Is it correct that plantar fasciitis would cause pain elsewhere in my foot? Like the arch? Is calcification a true diagnosis? Sorry for all the questions!! This really is debilitating though. I’m struggling to walk. Hi Stuart. It took several days for me to try to come up with a reasonable response. As stated in my personal page, I am not a doctor. I can, however, do some searching on topics like yours and try to respond intelligently. What I found is that severe heel pain can stem from up to six anatomical structures of the foot and ankle area, the plantar fascia being one of those six. Honestly, I couldn’t find a whole lot of information regarding calcification of the heel area. In fact, one very academic article noted that there was a lot of literature written about calcification of elbows and other upper areas of the body but very little written about calcification of the heel. One rather old article, written in 2000, mentioned that magnetic resonance (MR) imaging was a good, non-invasive way to see all the structures of the back of the foot. It would be a good article for you to read. 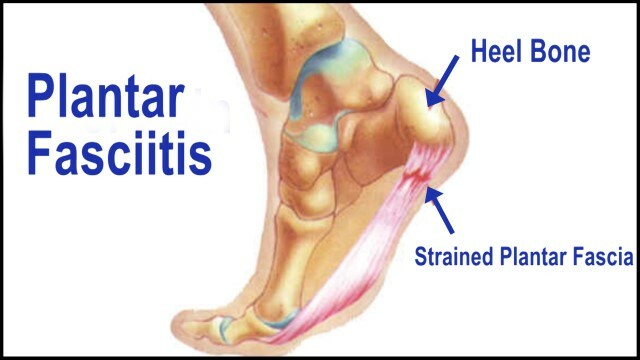 Using “calcification of the heel” as a search in Google, other links mentioned that tendons (including the achilles tendon) could be the cause of severe pain. The tendons could be irritated by jumping, running, hard-soled and back of shoes, etc. Inflamation of the achilles tendon was one specific cause, noting that the pain usually was nearer the back part of the heel. So, all said, plantar fasciitis could be a cause of the pain and there wouldn’t necessarily be pain in the arch. Calcification could be true but there wasn’t much I could find on that topic. I empathize with you; the pain can be debilitating. Second opinion? Why not? Ask about getting some kind of imaging picture that would help show what might be wrong. Sorry I can’t give you much more than this. It appears to be a very complicated picture. Keep doing the RICE and other things that are helping! Please write back at some point and let me know how you are progressing. * I was only on the anti inflammatory medication for 5 days. * I wore the ‘donut’ orthotics and am still wearing them. * On advice from a physic I wore ‘heel lifters’ which are basically little wedges that go under my orthotics that stretch my Achilles and also hamstring slightly. * I switched from a snooth ball to a knobbly ball and made my rolling on that more frequent and even to the point of putting all my weight on it by holding onto a desk/chair. * I did regular hamstring stretches and also calf raising and lowering on the edge of a step. * I also continued RICE. I can say I have improved incredibly as I wore a pair of dress shoes to work for two days in a row without too much pain, more like mild discomfort. I didn’t bother getting a second opinion as I believe I’ve made amazing progress from where I was to now with just doing the above. I don’t quite think I’m out of the woods yet so to speak but I can certainly say I’m about 90% better than before!! Thanks once again and I hope my info can help others too; as this pain was very debilitating at first, however now I can walk without too much (if any) after only a month of solid exercises. Wow, Stuart, what a fantastic reply. I’m so happy that all of the effort you’ve put into this has been producing good results. You’ve done a number of things that I’ve written about in my articles and, all combined, they are helping. Your information will hopefully be helpful to others who find themselves in a similar situation. All you can do is keep working at it. You are definitely helping to prove that no one thing is going to resolve plantar fasciitis problems for everyone. I’m happy to know that the info I’ve written has proven helpful to you. By the way, any idea what might have caused this flare-up in the first place? Great question Allyn! And unfortunately one I just cannot answer properly. I was fine one day and then it seemed to just appear. And progressively got worse and worse. I don’t do high impact activities, I have however worn hard soled boots for extended periods of time during my military career. However that was some 15 odd years ago. Plantar fasciitis really is a difficult thing. Obviously to deal with the pain and from my experience exteremely dibilitating and painful whilst trying to minimize its effects but also to define its cause – well in my case anyway. No one can pinpoint what the cause was/is. But – on a good note I’m still improving and each day walking without pain and now without discomfort is amazing. I encourage all with symptoms to persist with non intrusive exercises and methods that suit you. They’ve helped me! PS – I’m still continuing the methods as I really don’t want to go through it again. Once in a good routine it’s like any exercise, enjoyable and you feel the benefits both physically and emotionally. To relive pain immediately use Capzasin!!!!!!!!################!!!!!!! Lynne, based on all your exclamation points and pound signs at the end of your sentence, it’s obvious you are very highly emphasizing your point. Since you used the word “relive” (re-live? ), I’m not sure if you are stating that Capzasin causes you to re-live the pain or whether you believe it “relieves” (gets rid of) the pain. If you look up the details and specifications for this cream/gel, it says it is for relief of MINOR aches and pains of muscles and joints. Nothing talks about plantar fasciitis or pain in the fascia. There also seem to be some very strong precautions about how to use it (don’t get it on your hands, don’t breathe in the fumes from the dried application, etc.) and quite a few potential side effects. Did you use this and find it to be helpful for plantar fasciitis? Curious to know!